This Eldon kit is the worst-designed by far and took the most time to get it to look right (like the real 1:1 car.) If you search the Show Rod Rally you will see examples that are box stock and if you can compare them to a shot of the real car there is no comparison--A large amount of detail that's part of the real car is left out of the tooling and that is quite a shame. I remember seeing this thing roll by on TV in the early 70s and I was stunned that someone would build such a car--the fact that it was indeed a rolling bedroom was lost on this 8 year-old's brain but that was life back then. Soon after the plastic gods made a model of this car and it was offered at my local department store I drug out the lawn mower and made some quick cash. Once in my hands and ripped open, the sad fact was this was a kit that would fall short of my expectations. Since Eldon did such a great job of showing the real car on the box, it would daunt my model-making skills for decades. Finally in the mid-80s, when I got the bug to redo most of the kits from my childhood, this one was at the top of my list. The first thing I did was lengthen the nose to match the side shot on the box. Then the interior and all the window edging was built up and the triangular molding on the top of the doors was set in place. I also wanted the folding door to open and close plus match up with the body lines I think I may be the first to do this with this kit. My first attempt to vac-form (Mattel) off an original buck was done for this car--both the door and the TV were formed this way. The mirror at the rear of the interior was taken off a Mylar rubbing of the ceiling panels and the struts painted red with a triple zero brush. All the pink interior is "taffeta" material with custom-made pillows created with super sculpy and then covered in fabric. The inside of the upper door is also a sculpy form taken off the detail on the roof then covered in fabric. The bottom tail gate type door has 20 separate white velvet bars that make up the inset pattern. The wet bar has champagne and glasses the TV is lit with a 1.5 V-bulb showing a scene from star trek (couldn't find a viewmaster reel with a shot of Graumans theater.) The buttons on the stereo unit and desk lamp light up with fiber-optics. Ok yeah I'm a geek. The roof is also spread with matching fabric since I don't think anything else looks right. This is surrounded in foil covered edging. The engine air cleaner and oil bath is covered in gold Mylar cut to fit the contours. The antenna is wire with soldered end caps. I took the wheel inserts and painted them black and then carefully sanded the edge to get a crisp round pink-wall. The inside of the hubs are pink foil. The front wheels have movable steering. I felt the wind screen was way too thick, so I did one out of clear sheet stock. There are about 4 or 6 gauges on a small dash between the driver's legs. Also the real car had dual levers coming up on ether side of the seat instead of a steering wheel to hold the thing going down the road--if you ever see the clip of it driving, it's really all over the place. I was never a great fan of the bubblegum pink color, so I went with a darker nail polish lacquer that I liked better. I started with a red base coat then pin-striped the whole car with super-thin tape, painted the body white, removed the tape, then top-coated the car in dark pink lacquer so I have thin red striping on all the body lines. I know it's not accurate, but if it was my car I would restore the interior and body detail but paint the thing BLACK. The addition of the pink panther figure was done from a study of the original 60s opening scene of the cartoon and replicated in steel epoxy painted in flat pink. Oh and the cigar holder is a steel pin. My girl friend thinks this and the Bathmobiles are the weirdest cars ever but my 5 year old grandson loves it! Here is the original intro for the Pink Panther Cartoon show with the Panther Limo, courtesy of Youtube. 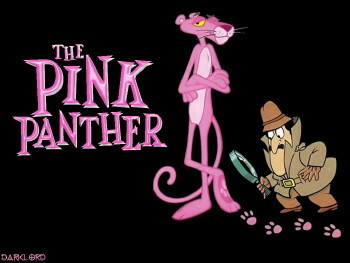 And to read about the whole Pink Panther franchise, click here for Wikipedia's complete synopsis.